Hey guys! So, I have owned these eyeliners for a few months now and decided to do a blog post about it because I know that a lot of people will automatically be intimidated by these bold eyeliners because they are so colorful. Bold, colorful eyeliner is a huge trend right now. I have recently been seeing so many pictures and articles about these types of eyeliners. I have seen Revlon, Urban Decay, Maybelline, Covergirl, Rimmel, Stila, NARS, and so many more. I'm not going to sugar coat it, at first these eyeliners were very difficult to work with because they are not your usual neutral eyeliner colors. In this post, I'm going to show you looks that are actually wearable and that you can mimic at home. And before I move on, I just would like to say I am not posting about these eyeliners just because I sell Mary Kay. These were just the most accessible colored eyeliners I had at the moment. These eyeliners are so pigmented! I think that is a big reason why they can be difficult to work because they show up very easily versus your regular eyeliner shades like black and brown. All of these looks work because the eyeliner is the main focus. When using these eyeliners, try to stick to all neutral colors for the rest of the face to avoid looking "overdone". Blue on My Mind is a bold cobalt blue color that I think looks best with a black cat eye. Anyone can wear this look but especially people with brown and hazel eyes. 4) After letting the black liquid eyeliner dry, apply MK @ Play Liquid Eyeliner in Blue My Mind. Apply using short, small strokes. Don't drag. This is probably my favorite color out of the eyeliners. It's a beautiful true turquoise color that looks amazing when you pair it with gold. 2) Apply Bare Minerals Pigment in Gold (I don't think they sell this shade anymore). Really any shimmery gold looks will work perfectly. 7) Apply a highlighter right under the brow and in the inner tear duct of the eye. I used MAC's Nylon (Dupe: NYX Barely There) because it is a little more yellow than Shroom to bring out the gold tones. Out of all these looks, this one is the most simple. 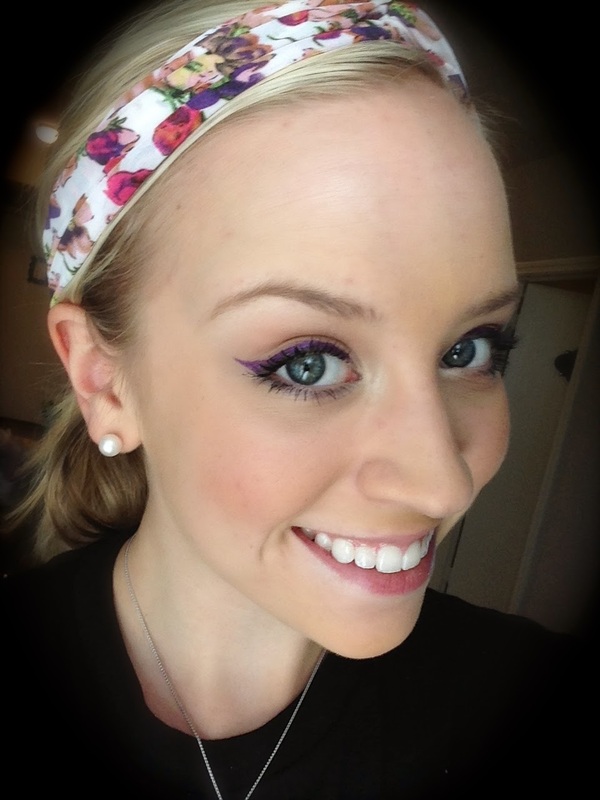 I love this purple shade and I think it would look amazing on hazel and green eyes. 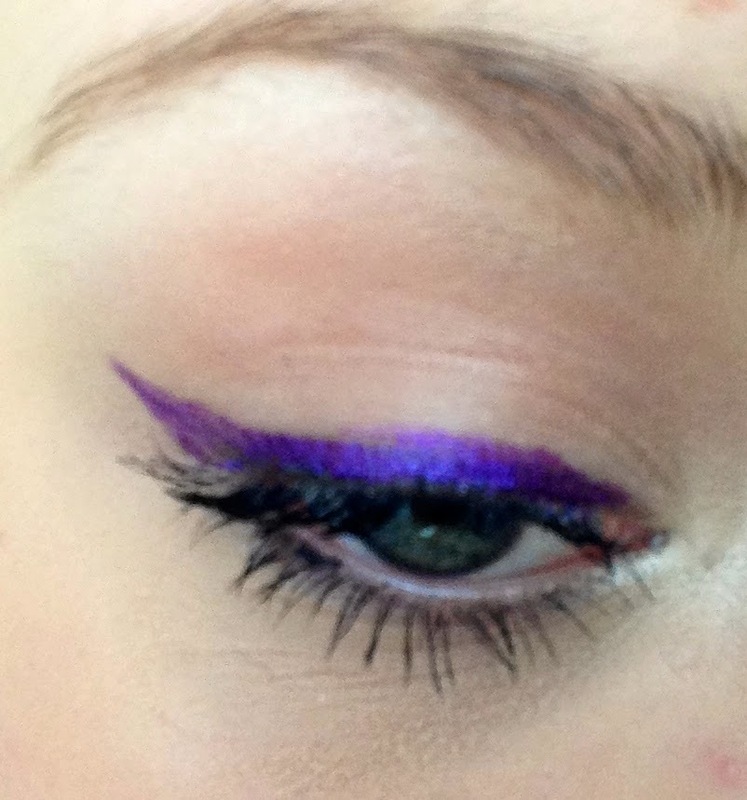 3) Apply MK @ Play Bold Fluid Eyeliner in Hello Violet using short and soft strokes. Slightly extend the eyeliner past the edge of the eye and fling it up to create a cat eye. I hope this post helped inspire you to get more creative with your makeup :) Don't be afraid to branch out!